The architect expressed the personality of a leading toy & game company whose products demand innovation and creativity. 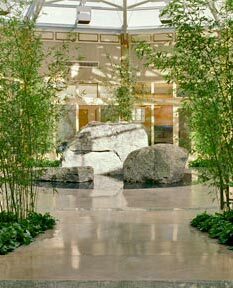 The project is a full-scale conversion of a 1950’s supermarket building for the Global Executive Headquarters of Hasbro, Inc. A central atrium serves as an inner sanctum for the corporate executives: it is a peaceful environment with natural materials and day lighting. Sophisticated building technologies have been discretely incorporated, including comprehensive security & building management systems, state of the art telecommunicaons & video conferencing facilities.